Platinum Hip-Hop has been smashing goals in 2016!! We are so proud and inspired by the dedication and heart our athletes have been showing and have come up with ways that we can further that experience with our competitive dancers to help teach them life lessons about setting goals as well as hard work and discipline. Every practice this year our athletes have begun by writing daily personal goals, and sticking them to the mirrors in front of where they practice their hip hop routines. When they accomplish their goal, they get to take their post-it home and display it to keep track of their progress. They can remember how far they’ve come and what to took to get there. 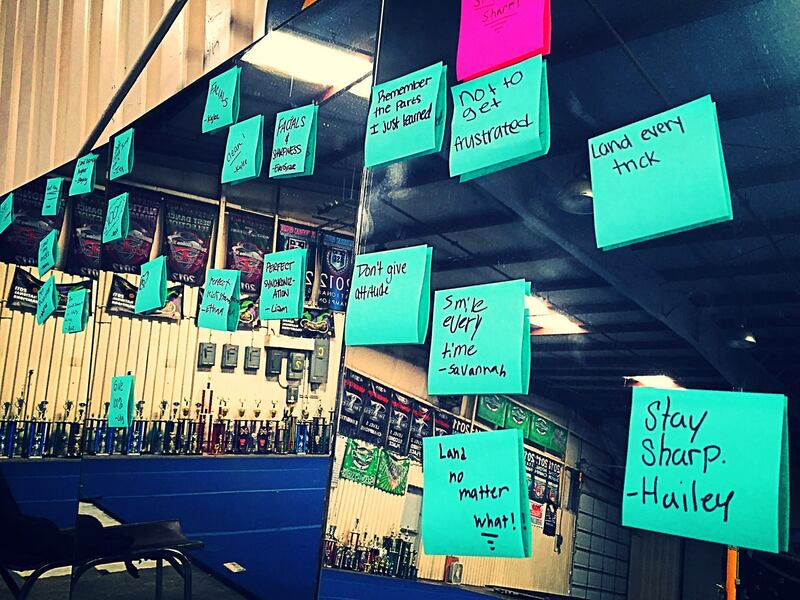 At Platinum Athletics, it’s all about the journey!This goal setting and measurement of their Hip Hop specific and personal dance goals has really helped each athlete stay focused on achieving their goals not only on the practice days, but on their days off as well! Our senior team has even taken it a step further! In addition to personal daily goals, we have established two team goals and one personal goal, and for each of these goals we have instituted action steps for a 30 Day Challenge!! Every single day these kids are encouraging one another to check in with their coaches by sharing updates, photos, and videos of the different ways they’re working to achieve their goals The encouragement among our athletes, the dedication they have inside and outside the gym, and the support system the have for one another is so inspirational!! Its so much more than just competitive dance and Hip Hop. We believe that this is just another way that we are helping our athletes grow both on and off the floor and that the sport we are so passionate about, competitive dance, is just the vehicle! We are so proud of our athletes and can’t wait to watch them continue to smash their goals in 2016. We love our hip-hop family! !